In the coming days and weeks I will also be adding additional articles featuring more intermediate and advanced WordPress SEO tips and eventually expanding more on off-site SEO factors and link building strategies. Almost all of the optimisation areas mentioned can be achiveved with plugins. Likewise pretty much everything the plugins do can be achieved through modifications to your theme. If you feel comfortable updating your theme and you don’t like plugins messing with your beautifully crafted HTML output then you’ll probably want to tweak your theme by adding relevant code snippets to do the majority of what the plugins can offer. Personally I do a bit of both, I like to optimise my themes as much as possible but still use plugins to fill in the gaps. Plugins are particularly useful if you like to tweak titles or descriptions on a post/page level and can save you qutie a bt of time for repetivite tasks. A word of caution though, don’t rely 100% on plugins to create completely automated descriptions, they are never as good as handcrafted descriptions. If you’re creating a new site or want create a new theme for your site it helps if you can build your site around a WordPress theme that is structured and coded well. Starting out with a theme that is at least partially SEO friendly will save you time but it’s not required. When selecting a theme either to use as a starting point or to use as it is have a peak at the the code of the theme first, both viewing the PHP files and the source code of the HTML output. Look out for a theme that is well coded and well structured, something that already includes title attributes on links and images has clear navigation and . One important factor is to make sure your theme always lists your content before the sidebar when viewing the source code of your site, regardless of where the sidebar is located visually in the design. This ensures that crawlers look at your unique content first and the sidebar content is secondary as it tends to be listed on all pages of your site. One of the first things you should do after a fresh WordPress install is to change the permalink structure. By default the WordPress permalink structure is ?p=<postid>. For both SEO and usability purposes you’d want your links to be descriptive e.g. /categoryname/postname or just /postname. WordPress permalink settings can be found in your WP admin interface under Settings > Permalinks. Under common settings select "Custom structure". Alternatively use /%category%/%postname%/ if you want to to include the category name before the post title. If you’re setting up a new blog with little or no existing content then changing permalinks is a no-brainer. Just change the settings before any of your content is indexed, However if you’re optimising an existing site then changing permalinks can have a huge impact unless take the necessary steps to setup up redirection. If your pages have Page Rank (PR) any change to the permalink will result in a loss in page rank for that page. If you setup a 301 redirect some of the page rank will normally pass to your new permalink but is a risk of some decay in page rank. Now that you know the potential impact of changing established permalinks The good news is that this can be addressed relatively easily using plugins. Redirection provides you with very granular control over redirects including ability to import a list or redirects from an existing .htaccess file as well as forcing either www or non-www prefix on your site for canonical urls. Once this plugin has been installed go to Tools > Redirection for settings. If you’re usiing Platinum SEO Pack you won’t need a separate plugin as it includes automatic redirection for changes in URLs and permalink structure. Keep in mind though if you do have significant page rank on some of your pages you may still lose some of the page rank even with a 301 redirect. This is typically more common if you migrate your site completely to a new domain and not really a problem when using 301 redirect for internal site changes. Personally I don’t really fuss to much about page rank, I mean it’s nice if my site or some of my pages get a little bit of a boost and it does seem to improve Google rankings a bit, however at the lower end of the specter PR1-5 it doesn’t really matter that much. By default your WordPress page titles will typically include your site name on the home page and "Site name » Archive » Post title" for archives and posts. This is not terrible but it could be better. Page titles should ideally be no longer than 60-70 characters, this is a general guideline from Google and it’s not an absolute requirement but you should try to stay below 100 characters. If you have a long site name and category name(s) and these are listed first then you run the risk of your actual article or post title being cut off or disappearing completely. Search engines also tend to weight keywords early in the title a bit higher and you’d to ensure that your carefully crafted post titles are visible and given all the emphasis possible. Your <title> should be as close as possible to your <h1> page/post title. By starting with your post/page title the first part of your <title> will match your <h1> post title. Personally I’d avoid including categories on post or pages as it tends to make the titles too long. The settings screens for page titles are pretty much identical for All-in-One SEO and Platinum SEO Pack. The settings screen for Headspace2 is quite different and offers more control but is perhaps slightly more difficult to use for beginners. You can also change settings and write custom titles and descriptions on individual posts or pages. If you add a title or meta description to an individual post it will override the global settings. To display the title on your home page or front page as “Blog title | Tagline” and single posts or pages as “Post/page title | Blog title” just add the following code to you header.php replacing the existing <title> tag. This might seem obvious and very easy to do but it’s something that can easily be overlooked. On all other pages change the site name and tagline either to an h3 or lower or wrap it in a div, personally I prefer changing it to a div as the site name is not what is important on subsequent pages and unless you’ve got an extremely well known brand it’s not what people will be searching for either. Spend some time writing descriptions for all your categories. When using wp_list_categories(); which is typically used in your main menu or category listing WordPress will by default use the category description as the title attributes for each category. I also like to add the category description as an H2 or H3 on the category archive pages in my theme. Category descriptions can also be used as your meta description on category archive pages. Category descriptions can be edited in your WP admin interface under Posts > Categories. 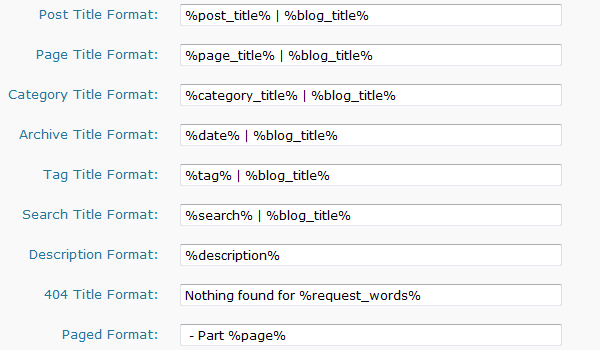 To display your category description on your category archive pages add the following to you category.php page. Alternatively if you don’t have a category.php page your can add the folloing to your index.php file or archive.php file. Meta tags have little or no impact on your actual search engine rankings. However your meta description in particular will influence whether people find your site listing in search results interesting enough to click through to your website. Google and other search engines will use meta description as the text you see below the title of the search result in the search results page. Home page: Make sure your home page includes a meta description that describes what your site is about. Posts: On single posts you have multiple options. If you’ve added excerpts to your posts then they’re ideal candidates for meta description. Whilst the description meta tag is useful, the keywords meta tag offers very little benefit for rankings or otherwise. In the early days of search engines this meta tag was often used and abused and as a result most search engines no use it for ranking purposes. Google has specifically stated that they do not give any weighting whatsoever to meta keywords, for further details see Google does not use the keywords meta tag in their ranking. Even though there’s very little evidence that meta keywords will help your rankings it certainly doesn’t hurt to include some relevant keywords in your keywords meta tag. The a quick and simple solutions for this in WordPress is to just list your tags as your meta keywords on individual posts. If you’er using an SEO plugin like Headspace2, Platinum SEO Pack or All-In-One SEO Pack you can set these to automatically add meta descriptions to your site based on a set of rules you can define. They will also allow you to override global settings and customise meta descriptions and keywords on individual posts by via an additional admin panel on the edit posts or page screens. 5. Customising WordPress "more links"
Using the <!-- more --> quicktag in WordPress allows you to limit the content shown from a post on your home page, archives or search page. By default the anchor text for more links will just say "read more" which is not great for internal linking. A better solution is to make the anchor text more descriptive and include the post title it’s linking to. This will is not only good for your internal site SEO but can is also a stronger call to action for your readers. If you’re using Headspace2 or you can go to Settings > Headspace then select Page Modules and drag and drop the more text module into the page module. This will add an option to specify the more text on a post by post basis. Personally I prefer to just use the post title but if you really like to tailor more links on a granular level then Headspace2 will make it easy for you to do so. If you want to insert something similar in your own theme open up the index.php file, locate where your the_content() is being called and replace is with the following code. This will set the more text to …continue reading “post title” adding quotes around the post title as well as wrapping it in a <strong> tag. It also adds a span around the anchor text with a title attribute listing the title again. If your design does not easily accomodate long anchor text or you don’t want to display the long anchor text for practical or aesthetic reasons then I suggest you at least include a title attribute on the more link. This won’t be as effective for SEO purposes but it’s better than nothing and it will assist your users. If you’re using Thematic just add the following code to your functions.php file. This will add a span around your more link with a class to allow you to style it differently with CSS. It also adds a title attribute to the span with the name of the post it’s linking to and includes the post name in the anchor text with the prefix …comintiue reading “post name”. The Google XML Sitemaps plugin automatically creates special XML sitemap and submits it to Google, Bing, Yahoo and Ask.com. Using an XML sitemap is a great way to ensure that the search engine robots will find and index all of your pages. It’s great to ensure new sites are quickly indexed and equally useful for blogs with frequent updates to ensure that new pages and posts are indexed. Using an XML Sitemap does not guarantee that your pages are included in search engines, but it does provide helpful hints for web crawlers to do a better job of crawling your site which is particularly useful if your site structure and internal linking is a bit shoddy. The plugin uses Sitemap Protocol 0.9 defined by sitemaps.org. It’s an open standard with support from the likes of Google, Yahoo and Microsoft. That’s it for now, the optimisation areas covered will improve your general on-page SEO for WordPress and hopefully give you a bit of a boost in rankings. In the next article I’ll be covering Canonical URLs and how to avoid duplicate content, how to format your posts using semantic HTML, tips for cleaning up your code and more. Hi, I found it very useful. Although I believe I am kind of advanced I found it not very easy to implement buy I will do my best. I tell you how I went. Thanks for this post. For the seo newbie this is a great resource. I like the read more addition, I use suffusion theme which has a built in option to replace this link. I added a call to action that includes the site’s main keyword, but this is a great way to deal with it.